In October of 2010 Autism Research and Resources of Oregon expanded its online presence to include a Facebook Page at http://www.facebook.com/ARROAutism . By October 18th, 2010, ARRO had reached the mininum number of followers to create a custom URL. While Facebook growth has been slow, activity at ARRO has been anything but. You can learn more about the Westside Center events by visiting http://arroautism.org/westside , or by searching the Archives for posts with the Westside Family and Community Center category. 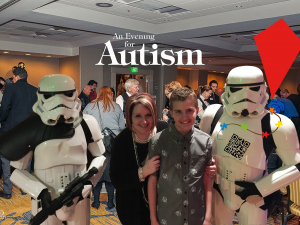 Even as the Center, which is dependent on your donations, continues to grow, work to expand its online presence continues to grow, too, including the recent addition of a Twitter Feed at http://twitter.com/ARROAutism . Email subscriptions are also available, and more online activity will follow, so stay tuned on ARROAutism.org and learn how Autism Research and Resources of Oregon is striving to bring you news about Autism in Oregon and SouthWest Washington, and continuing to work towards its mission. The Autism Research & Resources of Oregon (ARRO) will produce and promote a center of excellence in the field of autism research and services in the state of Oregon. This center will be known as the Oregon Autism Research & Services Center. This Center will have as the core value nurturing of individuals and families of individuals with autism so that they may contribute as appropriate at the level and the time when they are ready to contribute. Services; the identification of and coordination with existing agencies, and development of new programs that benefit both the individuals with autism and their families. Work with autism and autism like disorders such as Asperger Syndrome and Pervasive Developmental Disorders. Work with individuals with autism of all ages and their families. Have multidisciplinary research which includes medical, educational, psychological, social services, and/or vocational training aspects. Promote the inclusion of individuals with autism in their families and communities. Help families assist each other by encouraging grassroots and family driven programs. Create ongoing relationships with businesses, schools, and community service agencies to develop skills so that these individuals can be contributing employees and citizens. Verify all projects and programs using scientific research methodologies and documentation. Develop best practices paradigms for all projects undertaken. – partner with local universities to provide training prototypes and practicums for future professionals in field addressing these disorders. – house and partner small business to encourage the development of vocational training opportunities. Rent or provide office space and meeting places for autism related organizations (both non-profit and for profit) and agencies; such as Autism Society of Oregon, Project PACE, Center for the Study of Autism, Autistic Children’s Activity Program, Inc., county developmental disabilities program offices, etc. Do co-ventures with off-site businesses to provide vocational training and employment opportunities. Provide a place that fosters and advances the existence and development of multidisciplinary model programs and services. Do what is required for the person with autism to make the maximum recovery from autism; not the minimum required by law or allowed by insurance companies. Help the person with autism lead their lives to the fullest measure possible. Help the families of people with autism lead full lives, not lives overcome by the existence of autism in their family member. Be a place where professionals, families, and individuals with autism can work, interact, recreate, and play together; and feel secure so they may learn and grow. Yikes! Technical difficulties! For some (very strange) reason, this went out as many as 7 times to some of you! Egads! So sorry! I think it is fixed now. Please let us know if it’s not!